USD/CAD is trading flat after hitting low of 1.13289 level on Mar 13th 2019.The pair halted its uptrend at 1.34675 and started to decline more than 100 pips on surge in crude oil price.Markets eye Canadian manufacturing sales and US UoM consumer sentiment data for further direction.The pair hits high of 1.33470 and is currently trading around 1.33345. Crude oil jumped sharply from low of $54.50 and hits fresh 2019 high. The jump was mainly due to unexpected drop in crude inventories and US production is supporting crude oil prices. It is currently trading around $58.50. On the higher side, near term resistance is around 1.3350 and any convincing break above will take the pair to next level till 1.3380/1.3466. Any violation above 1.3470 confirms further bullishness. 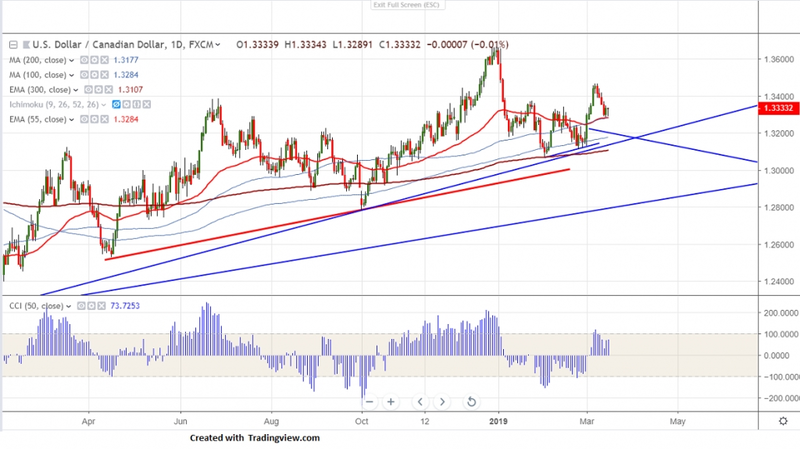 The near term support is around 1.3278 (100- day MA) and any break below will drag the pair till 1.3230/1.3173 (200- day MA)/1.3100. It is good to sell on rallies around 1.3380 with SL around 1.3450 for the TP of 1.3110.